For over 15 years, the organization has led migrants from Central America to seek asylum elsewhere. As he stood among the mothers, children and LGBT youths who had been walking through Mexico on their way to the U.S. border, Rodrigo Abeja found it hard to believe that President Donald Trump had deemed these people dangerous. Abeja is one of the lead organizers of Pueblo Sin Fronteras, which for over 15 years has led migrants to the U.S. via caravans to help them to seek asylum in other countries. "These people are frustrated and desperate," Abeja said in Spanish in an interview with NBC News from Mexico. The group's volunteers help the migrants stay together to protect themselves from danger along the way, including from criminals and natural elements, but also to move past law enforcement officials. The organization had been relatively unknown to most Americans until the president began tweeting about the people Abeja and volunteers began accompanying to the border during Holy Week, the final week of Lent as commemorated by Christians. The president's tweets came after a story by Buzzfeed headlined "A Huge Caravan of Central Americans Is Headed to the U.S., and No One in Mexico Dares to Stop Them." The caravans are referred to in Spanish as Via Crucis Migrantes, or Migrants' Way of the Cross. They are fashioned after the Stations of the Cross processions celebrated by Latin American and Latino Catholics to mark and "re-enact" the final days of Jesus from prosecution to his burial in a tomb. In such processions, someone plays Christ carrying a wooden cross and people from the congregation or community follow him. Similarly, the volunteers from Pueblos Sin Fronteras and other groups accompany migrants in a caravan that travels in buses, on trains and on foot. Pueblo Sin Fronteras also runs a shelter for migrants. Abeja said this year's caravan is different from previous years and there is cause for concern, but not of the sort Trump raised in his tweets. Abeja, who has been helping out with the caravans since 2013, said about 1,175 people were taking part in the caravan this year, with some fleeing gang violence in El Salvador and many more from Honduras than in previous years. “About 80 percent of them are from Honduras," he said. "We have around 300 minors ranging from 1-month-old to 11-years-old. As of the rest of the people, we have about 20 youths who identify as LGBT and about 400 women." Trump says 'caravans' of immigrants are headed for the U.S. What's he talking about? Abejas said the Hondurans in the caravan are fleeing the continuing political crisis and violence there that escalated in November with the election of President Juan Orlando Hernández. His election was seen as rigged and was followed by violent protests that were shut down with a military-enforced curfew. At least 30 people were killed during Honduras’ election aftermath. The Organization of American States called for an election do-over after finding "irregularities and deficiencies” in the Honduran electoral process. But the United States recognized the election’s outcome without insisting on another election or a review of the results. The Obama administration faced a surge in arrivals from Central America, mostly women and children, at the U.S.-Mexico border in 2014. The numbers forced the administration to set up emergency shelters and a family detention center in Texas. The administration also was criticized for some of the steps it took to stem the surge. Trump shut down the Central American Minors Program, which was set up by the Obama administration to provide a way for Central American children, and later young adults rejected for refugee status, to get a temporary stay in the U.S. if they had parents already here. 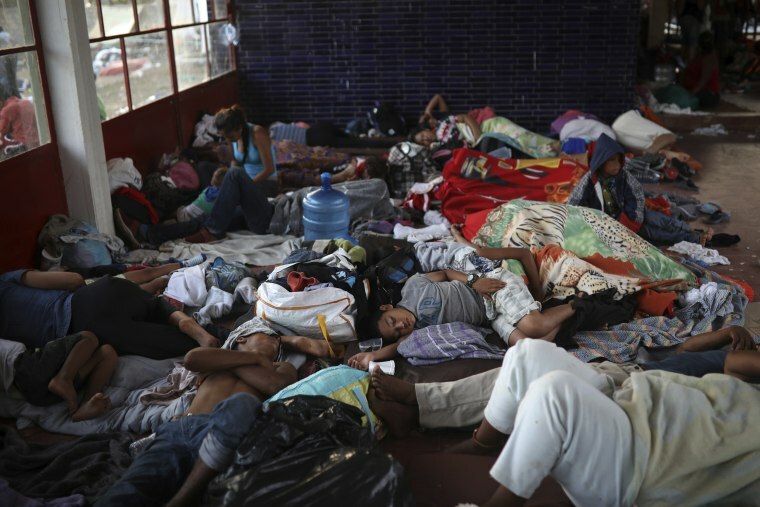 The conditions that prompted the 2014 spike still exist in Central America today, said Daniella Burgi-Palomino, senior associate with the Latin American Working Group, which issued a report on conditions Tuesday. "People are not leaving for economic reasons or to take advantage of a system in the U.S.," Burgi-Palomino said. "They have real valid claims of fear of returning to the country. They don't have access to justice. The refugee crisis from the Northern Triangle has not ended." When they get to Mexico, the Honduran migrants visit different embassies and consulates, including those belonging to the U.S., to try to be officially recognized as asylum seekers. “When Mexico rejects them, the next step is to go to the U.S., and the safest, most organized way to do that is through the caravan,” Abeja said. After Trump’s tweets threw unprecedented attention to the caravans, Abeja and the team of Pueblo Sin Fronteras had to rethink how to help these migrants. Pueblo Sin Fronteras was arranging a day to get legal experts to review the cases of all the people in the caravan, and determine who has asylum cases highly likely to win, Abeja said. Those that do will carry on with the caravan. The rest have to stay in Mexico, facing the same asylum process that already rejected most of them. Additional reporting was contributed by NBCNews.com reporter Suzanne Gamboa.